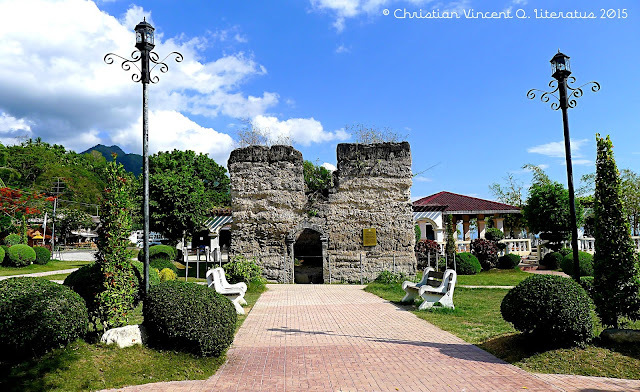 One of my favorite destination in Cebu is the southern part because it is teeming with unspoiled spots that are both famous and lesser known to a regular tourist. Alegria stands out as a haven for adventure of the undiscovered wonders hidden from the abusive hands of some tourists. 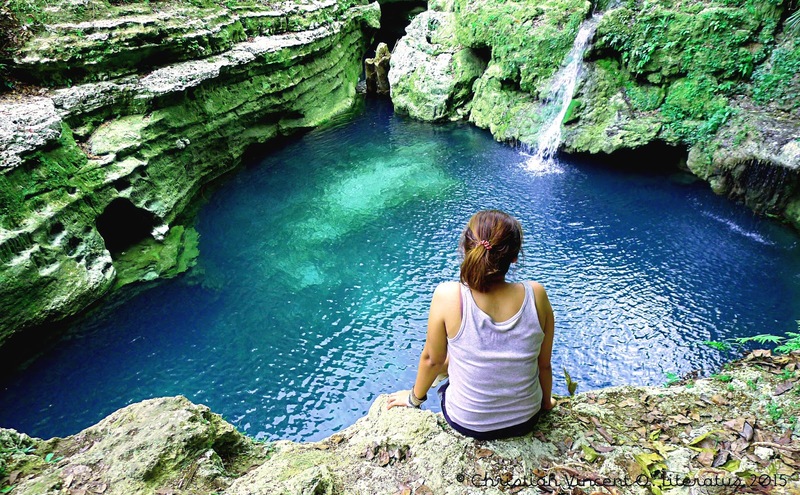 The municipality may not have stunning beaches but it makes up by awakening that adventurous heart of yours through an assortment of experience from spelunking the awe-inspiring caves of Cambusay & Salay, chasing the many grand waterfalls hidden in their mountains such as Cambais, Kawa Kawa, Montpeller, Cancalanog and Kitara. 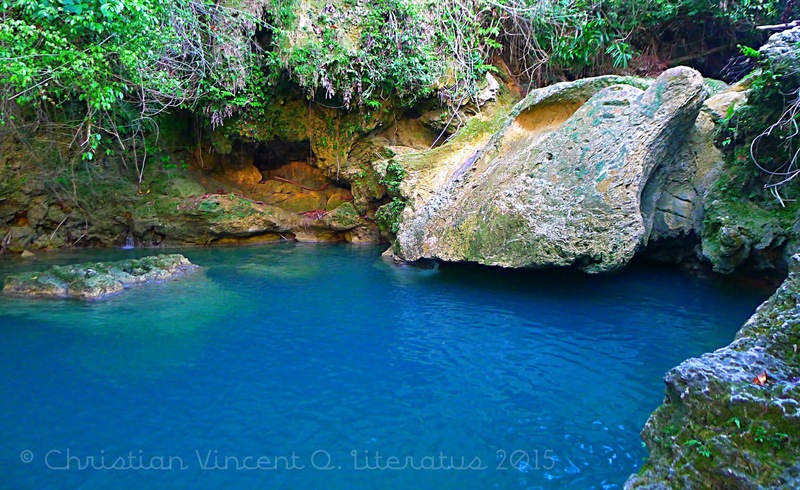 And it is one of the only two destination in the province which offers canyoneering. Alegria is just like any other coastal town in south of Cebu which retains most of the signature characteristics of those towns such as century old churches, friendly locals, culture centric freedom parks and most of all that refreshing salty breeze of the ocean. 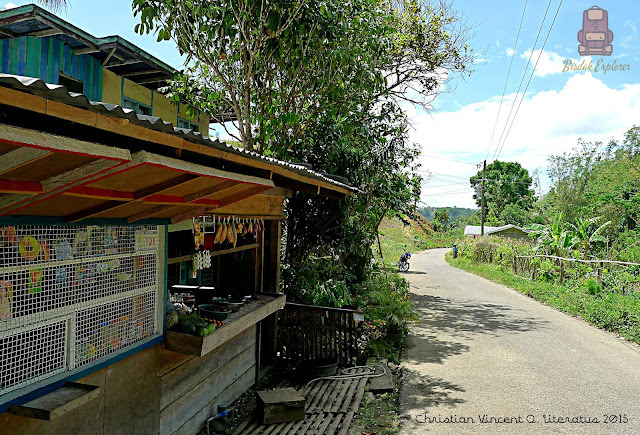 The people here lead a simple life away from the hustle and bustle of the big city. You won't find any fast food chain here for now ( though it's creeping real close ) and you will have to delight in the good ol' carenderia to serve your meal which is more healthy and economical. If you take time to walk around you'll witness the traditional way of living by the laidback Cebuanos. One of the rewarding sight I have seen are the middle aged women washing their clothes in a small aqueduct built to supply fresh water in the town which empties in the shore. There's just something so relaxing watching the crystal clear freshwater of river meeting the sparkling seawater. 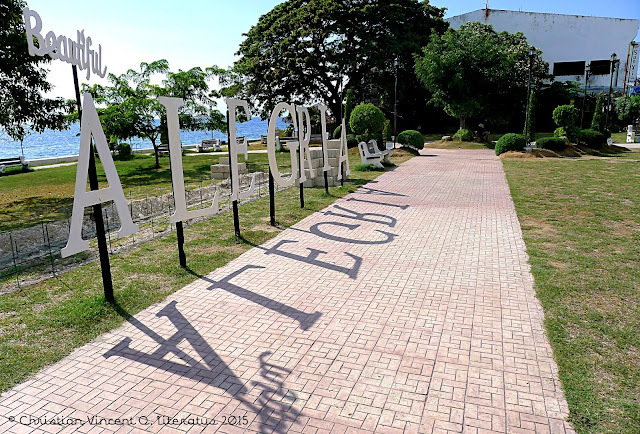 The freedom park offers a refreshing smell of the sea and a good place as well for some photo shoot because it enshrines the rich history and cultural spirit of the municipality. Just across the street is the Saint Francis Parish Church which was built in 1854. The advantage of it being a coastal is that the sea is within easy reach and it may not have that milky quality white sand you are dreaming of but it does have that crystal clear and some coral reef to dive in if you are into that. Undoubtedly, you surely will not come here for those things because they are nothing more than an added bonus in venturing to this quaint town. Alegria's best kept wonders are hidden deep in the mountains and we've already visited Alegria twice yet still haven't fully explored it all. This is what this blog is all about to serve as a guide for you to experience those wonders for those who have the attitude to embrace the adventure because getting to those spots is no walk in the park. Honestly, I have no interest in spelunking because it can get claustrophobic easily in some point and messy especially if the cave is dry and if there are bats all over the ceiling taking a poo anywhere in the ground you walk in and sometimes even crawl. And probably the number reason why I don't like caves is you spend most of your time navigating a dark tunnel and unlikely be able to appreciate the view inside because you will even have a hard time seeing what's in front of you most of the time. And these two caves have proven that my belief is not always right. It was a sunny Saturday morning and almost noon time when we arrived in Alegria the first we visited the town. 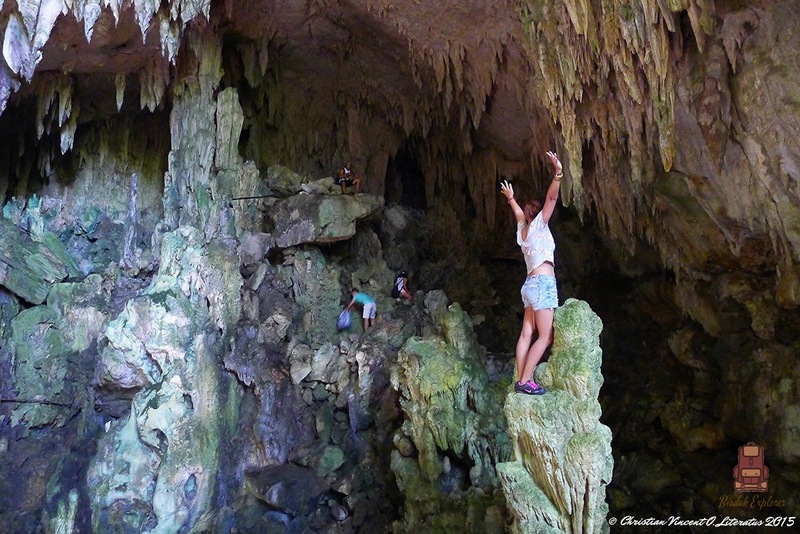 Project Waterfall has an ambitious itinerary at this time to visit three waterfalls and make a side trip in Salay Cave. Almost three hours ago we left the south bus terminal quite late from the expected time we decided. We go straight in the public when we arrived in the town to make some deal with the habal-habal (public transport motorcycle) drivers to give us a ride to any of the waterfalls we planned to visit. The mantra about "we don't always get what we want" resonated most in our case here. Most of the drivers refused with the deal we are proposing and some of the greedy ones asked a huge sum of money because according to them some of the waterfalls are way too far. So we decided to settle for one waterfall instead that is much nearer and explore some caves in the process. 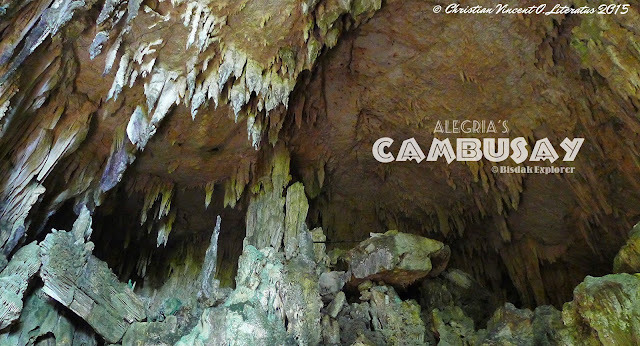 Cambusay cave is one unique cave experience in so many ways because it has a huge opening which let in more light thus her beauty exudes out even more thanks to the light. According to our guide some outdoor celebrities been here already still this cave is not that known to the public compared to Balay sa Agta in Argao. 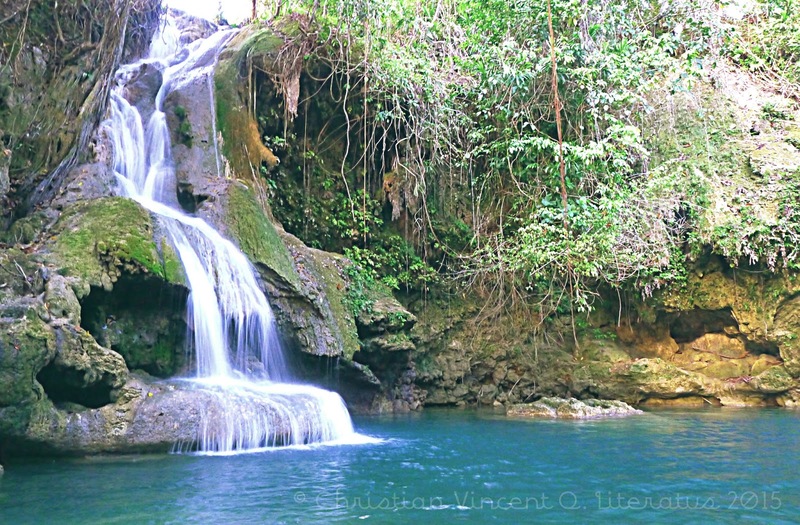 It has a huge chamber with stalactites flowing down like fossilized waterfall which probably where it got its name because "busay" in local dialect is conveniently translated to waterfall. Majority of the stalactites and stalagmites here are mostly dead *which is really sad* so the challenge presented is climbing those debris of the cave piled up on each other. 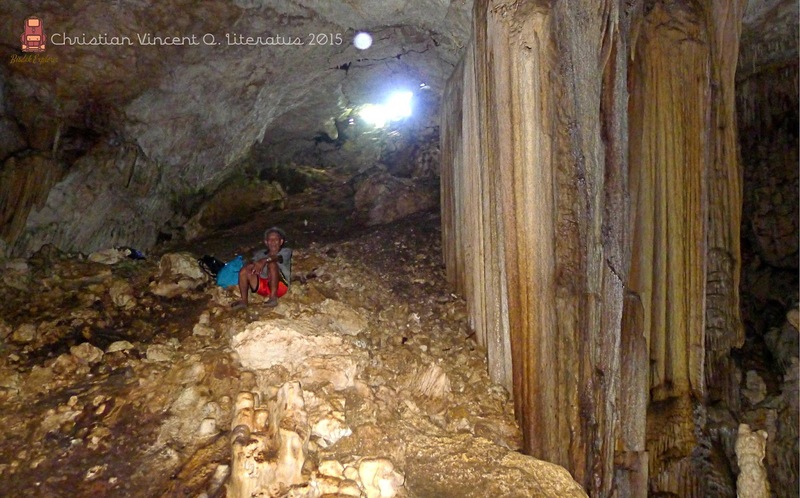 This lead to an upper chamber which has an opening on its own leading to Salay cave. GETTING HERE: From the public market in Alegria you can find the habal-habal drivers lounging while waiting for passengers. You can haggle a ride to take you to these destinations where you can hit three birds ( Cambusay Cave, Salay Cave, Kambais Falls ) with one stone. On this route two caves and some waterfalls depending on the deal you made with the driver on where he is willing to take you and the time you have for exploration. The best deal we haggle is around Php 70.00 per pax (one way) and we are cramped to around three passengers in one habal-habal. This is your cue where you should be dropped off. You may ask assistance on that sari-sari store to find you a guide. The owner himself volunteered to guide us and you should tip generously if he decided to guide you. The trek from here to the cave has a moderate level in difficulty and is very scenic in some part. It takes around 20 to 30 minutes or more depending on your pacing with the trek. There are some steep ascends that will make you catch your breath but mostly it is just a walk in the park. Salay cave has more of the uncharted feel to it. Most of the stalactites and stalagmites are alive and well glowing in pitch darkness in the inner chamber of the cave. The challenge starts in going inside the cave because the opening is quite small in a very inconvenient kind of way especially for those with a larger body mass or structure. I could not fully make out the full magnitude of the inner chamber because we did not brought enough lighting with us but I got a feeling that this is way bigger than the latter and obviously have more chambers open for exploration for those who will allot a time & proper equipment here to go spelunking. 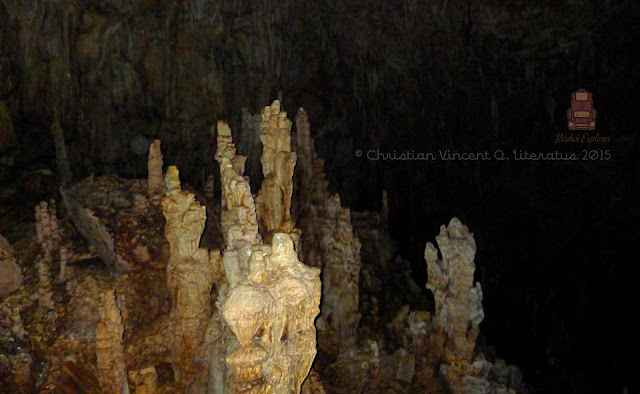 This is the only I took of the cave formations inside Salay Cave because it is pitch dark. The gang clearly enjoying the experience. What I love about this cave is that it is vibrantly alive. Once the stalactites and stalagmites catches a light the crystal glows like thousands of diamonds are placed in a rock. It is really that beautiful and knowing it is a living cave we have a responsibility to keep it that way. 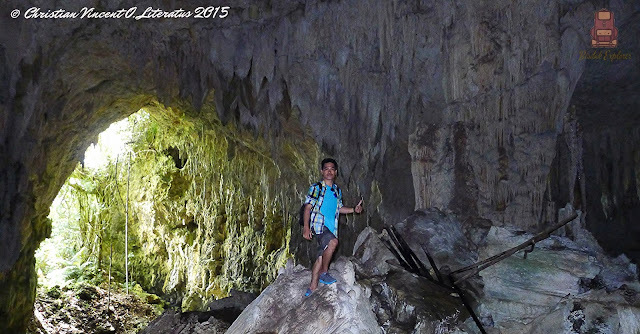 I'm going to highlight this because it is very important : touching those living cave formations *stalactites & stalagmites* is strictly prohibited because the oil in our hands can kill the growth of that formation. 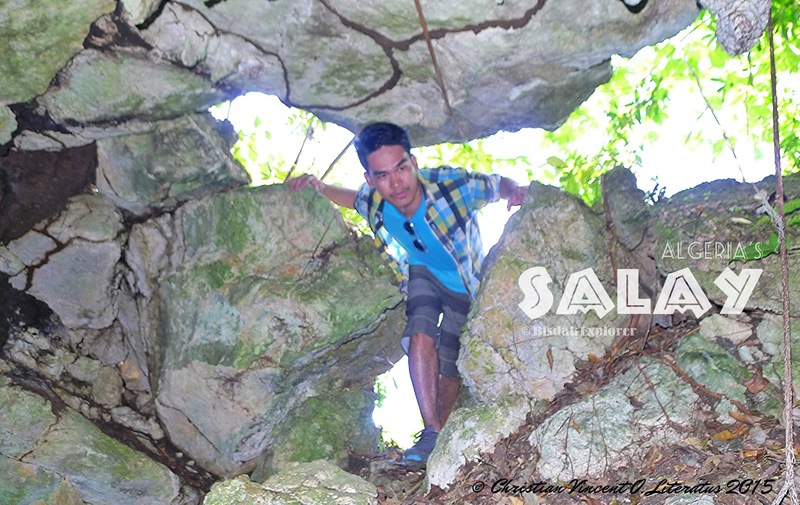 It is important to have a good light source such as torchlight or flash light to truly appreciate the beauty inside Salay cave. Our super helpful guide - Kuya Toni. GETTING HERE: It takes around 15 minutes of trekking from Cambusay cave going to Salay cave and a good guide knows a shortcut that will cutoff the walking time going back to the town. 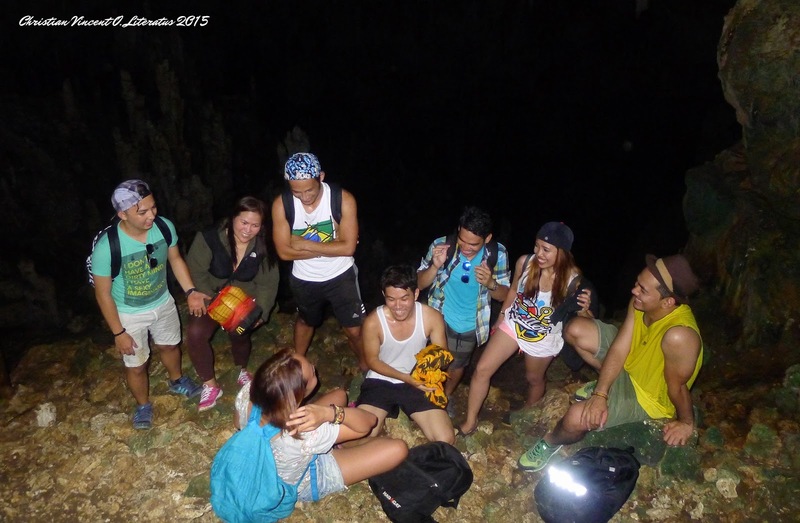 We took another route which lead us to Salay Cave and cutoff our walking time to the house of the guide for around 15 minutes. This waterfall I'd say is one of my top pick for a top waterfall to visit in the province. 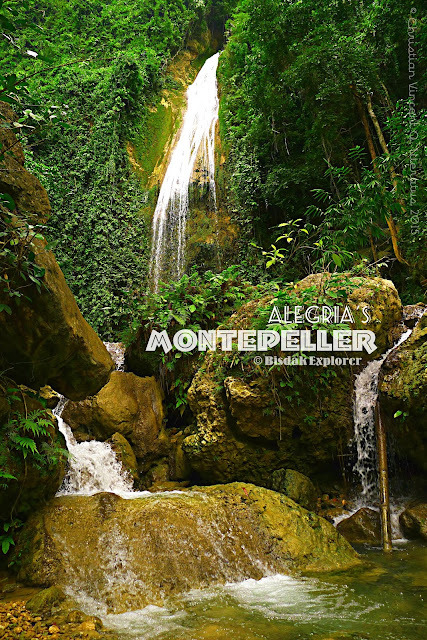 It may lack a majestic cascade to boast but the beauty of the waterfall herself and everything that surrounds Cambais are more than enough to make you pack your bag and head out to Alegria. 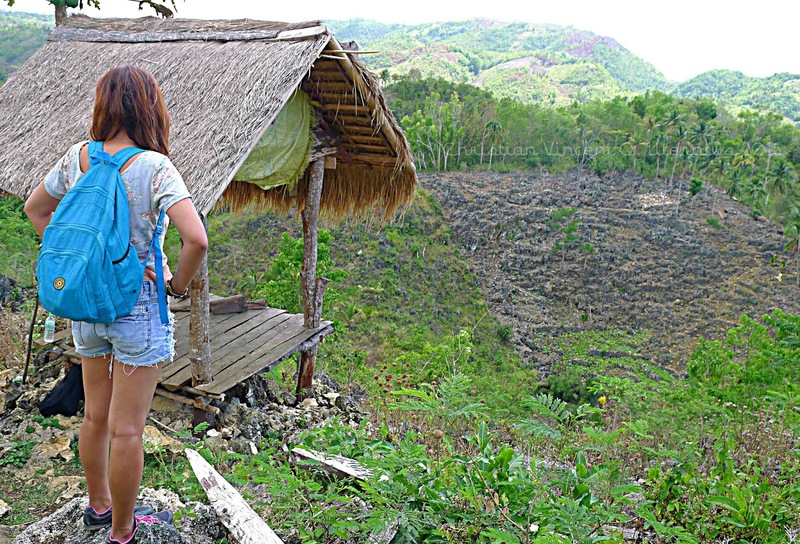 The scenic trek will open your eyes to the flora on this side of the Philippines and it is a visual feast for your senses than a burden for your feet especially for those not used to walking. The river along the way glows from deep hue of blue to an emerald green. It is THAT clean! Once you reach the first level of Cambais you will be rewarded with a wall of wonder with a waterfall manage to mold a memoir in the wall with her free flowing beauty. You may opt to stay here if you want because this spot is picturesque enough but for those like us who can never stay still until every nook & cranny are explored then proceeding to the second level would be a wise decision. Exploring the second level can get a little tricky. 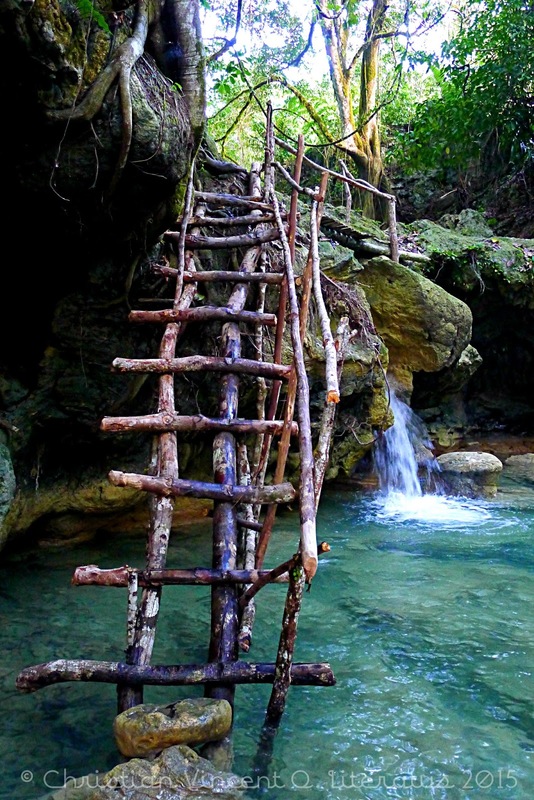 You need to pass through an almost waist deep river and then climb a slippery rock that can probably be hard to do during rainy season as the current get stronger and water deeper. Rest assured though there is another longer route if you don't feel like dipping in the river. A short scenic stroll follows after climbing that rock. Cambais Falls second has multiple small cascades which can look really beautiful in a photo taken by a good photographer. You can do a lot of activities here either relaxing in the smaller pool which formed in between the cascade. Or if you an adrenaline junkie you can try a cliff dive in the mini cliff just in front of the waterfall. GETTING HERE: There is a visible sign in the main road that points to where Cambais is located. It would take around 10-15 minutes of trekking from that sign to the first level of the waterfall. 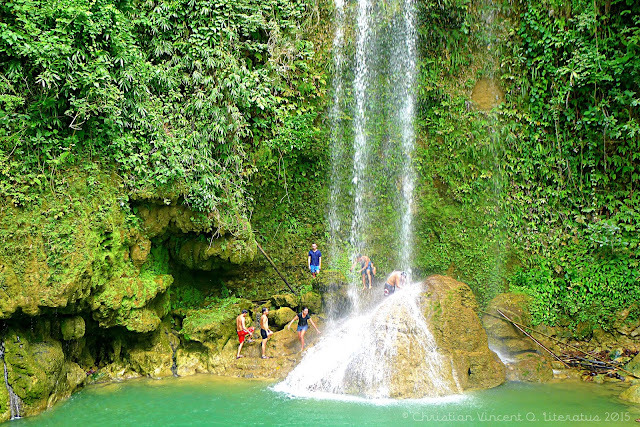 There is a Php 20.00 entrance fee paid near the waterfall. TIP! There is some lodging where you can have an overnight stay located where you will be paying the entrance fee. I wasn't able to get the rate but this is good news for those who want to take it slow in exploring the place. Cancalanog is an embodiment of fun and beauty. I'm at loss of words the moment I laid eyes on her splendor. 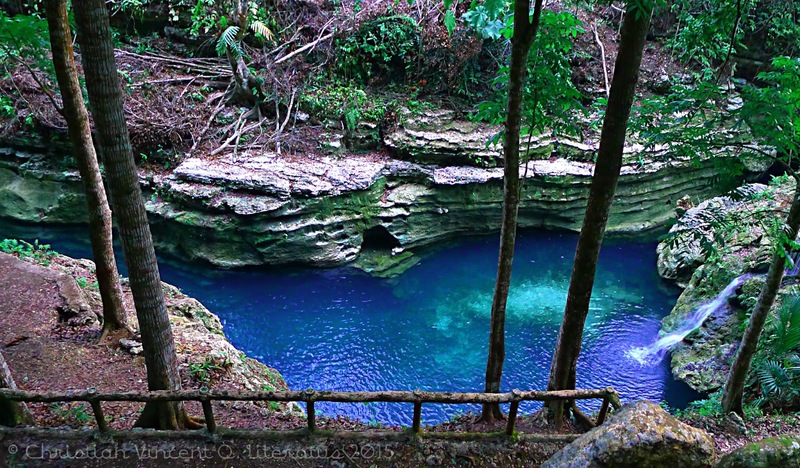 The water glows from an emerald to sapphire hue depending on where you are standing. This phenomenon probably made possible by the minerals in the water or the rock which surrounds it. I surely have no way of explaining such beautiful occurrence in nature. The rocky formation around the river is no less stunning as well. It forms layers of sedimentary rock which fossilized from millions of years change in the Earth's crust. The gloomy autumn appeal of the spot cause by the fallen leaves left undisturbed in the ground is perfect to set anyone's mood for a photoshoot and it also has some dilapidated structures in the area such as the bridge, aqueduct and a ruined house. If you explore a little more tracing the flow of the water you will be treated with a refreshing spot - a beautifully formed cold spring. 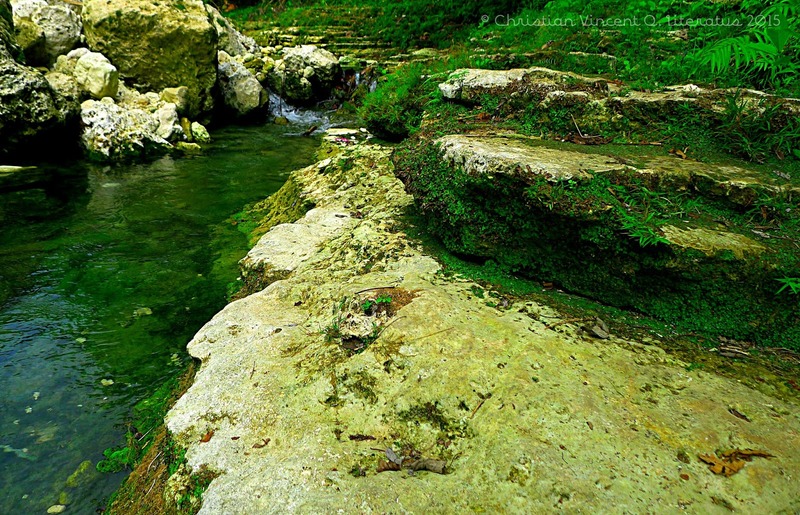 This naturally formed swimming pool kept intact with an elegantly formed liners made from a fossilized sedimentary rock. The water is super clear which can surely re-energize your body from the tiresome trek going down to Cancalanog. I take my first dip on this spot before going to the waterfall. This is the place to relax and just experience the healing wonders of nature. All your stress and worries dissipates to thin air if you soak your whole body and just let it take in the healing property of the water. 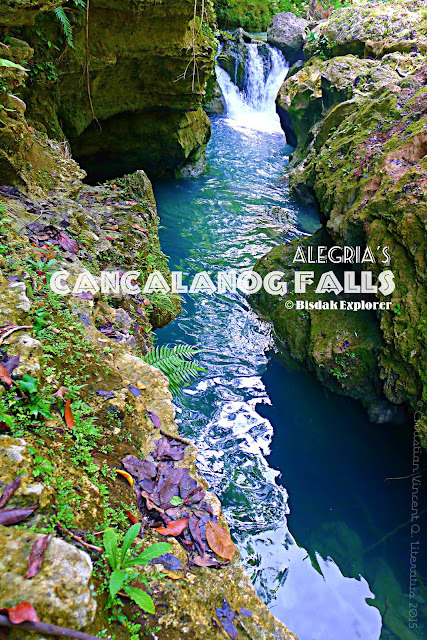 This small spot is the source of the small flow of Cancalanog but not the river itself because it span miles ahead. 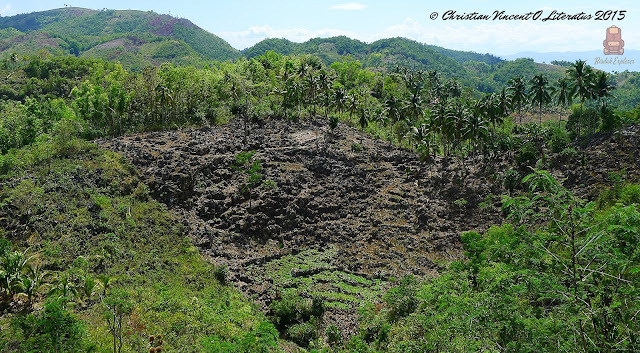 GETTING HERE: This is entirely out of the way from the Kambais, Salay & Cambusay route. You have to head over to Sangi ( one of Alegria's baranggay ) to find a habal-habal to take you here. Alegria Town Proper to Sangi costs around Php 10.00 per pax via tricycle. 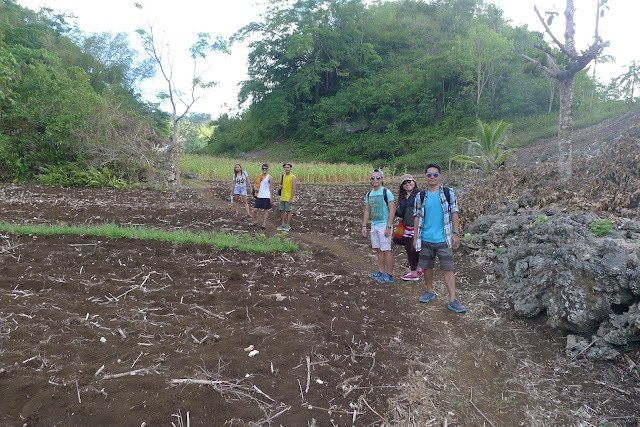 Once in Sangi, you will find a lot of habal-habal you can make a deal with to take you to a drop point in Cancalanog. It's a bit pricey but it will be worth it. We strike a deal of around Php 150.00 per pax (two way) and there are two people in the habal-habal which make me it around Php 300.00 per habal-habal (two way). If you are good in making deals then you probably can lower that and it is not really that far. Montpeller is a sweet surprise for my personal experience with it. 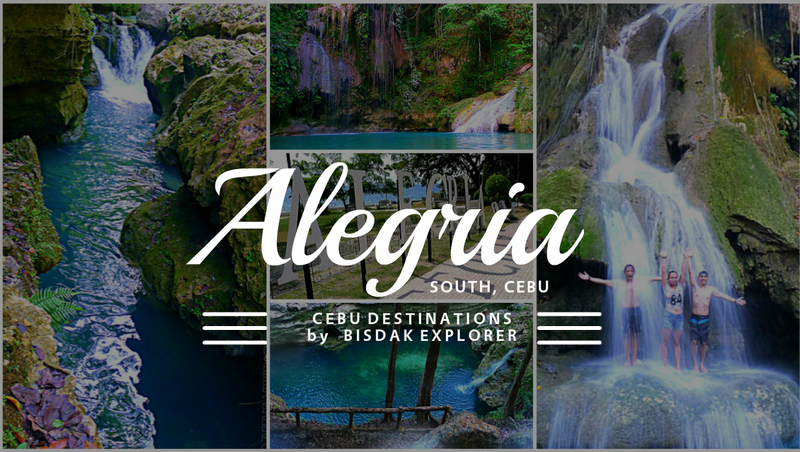 Alegria is filled with so many beautiful spots already that I did not expect one spot such as this beauty can be overlooked and has potential to top all other spots. The moment my eyes witness her beauty spiraling down a cliff of around a hundred meters I knew we hit a jackpot of an unspoiled waterfall that very few people at that time experienced. She is a classic plunge type that beautifully pummel down in a huge rock as if eagerly waiting for her embrace. If I am not a mistaken a lovers myth can easily be told between the two because I am just amaze of how the rock perfectly placed to receive the flow of Montpeller Falls. The beautiful green foliage around her made the spot surreal and perfect as well for a creative shot. Ultimately, it was an another beautiful experience for all of us waterfall chasers which fuels our aspiration more in search of such spectacles in nature. Honestly, Kawa-Kawa was underwhelming to me. After being exposed to all of the beautiful things in Alegria we traveled quite far to reach this waterfall and what welcomes us is a big rock with water dripping all over it. Kawa-Kawa Falls is a fan horsetail type of waterfall with her water spreading like a fan and remaining in contact with the rock in most of the flow. It took us five minutes of trek from the main road and she has three levels. 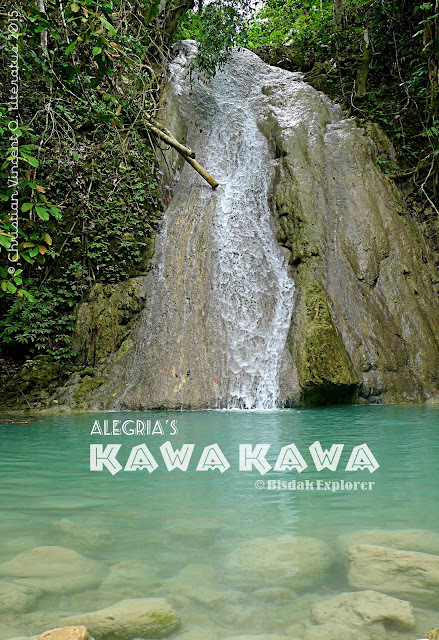 What I admire of this waterfall though is the dreamlike color of her water *a muted version of Kawasan's color* and she is a perfect place for adrenaline junkies. Some of my companion literally jump *not slide* through that slippery rock into an uncertain water. 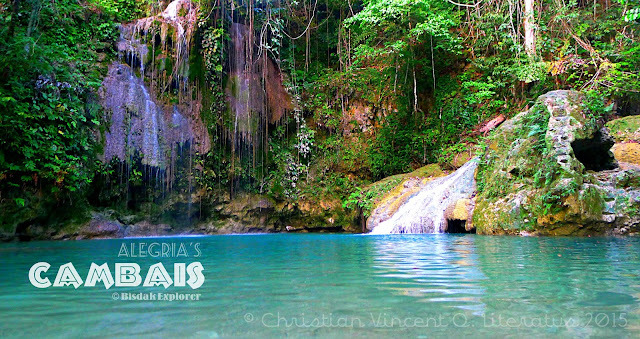 Nevertheless, she is a must stop for the sake of completing your list of visiting the stunning waterfalls in Alegria.